What is a Colorado Promissory Note? Colorado Promissory Note: What Is It? A Colorado promissory note is, when properly executed, a binding legal agreement between a lender and a borrower. 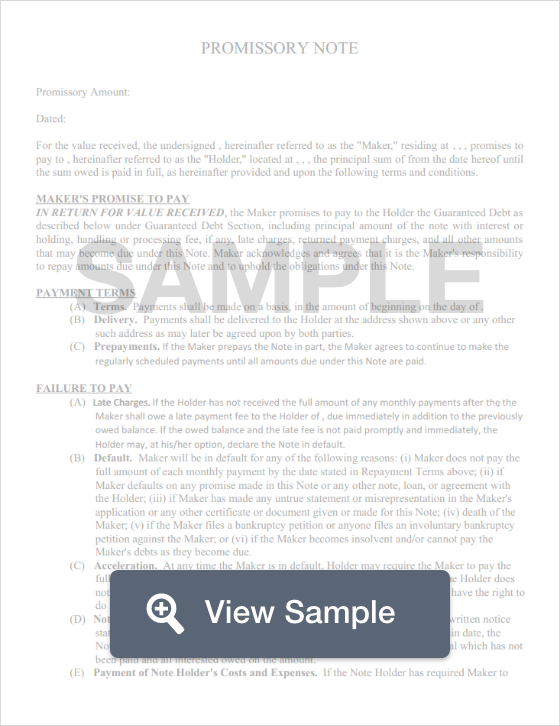 The essence of the document is that the lender provides a loan and the borrower makes a promise to repay it. Colorado promissory notes are regulated by Colorado law. Because promissory notes are treated as a security and because they are contracts, they are subject to several sections within Colorado’s Revised Civil Procedures. A Colorado promissory note may be secured on unsecured. When a promissory note is secured, the borrower promises to turn over an item as collateral to the lender if the borrower defaults on the loan. An unsecured promissory note does not use collateral. If the borrower defaults on the loan, all the lender can really do is file a lawsuit against the borrower. Usury laws are also an important factor in writing a Colorado promissory note. Regardless of whether the note is secured, there is a limit on the amount of interest that may be charged. Usury law is what sets this rate. In Colorado, the maximum amount of interest that may be charged depends on a few circumstances. If there is no agreement for a loan, the maximum interest is 8%. However, within a contract, such as a promissory note, the maximum interest rate that may be charged is 45%. In some instances, the maximum consumer loan interest rate is 12% instead of 8%. You can learn more about interest rates in Colorado by reading this helpful guide created by FindLaw. However, these rates are for personal or consumer loans. They are not for mortgages, business loans, savings and loans, or agricultural laws. The date that the Colorado promissory note was created. This should be listed in the order of month, day, and year. Include the full legal name and mailing address of the borrower. The note should also explain that the person named is, indeed, the borrower. For example: John Q. Public, Borrower. If the promissory note is secured, it may be prudent to include the physical address for the borrower. This will help if collateral needs to be retrieved according to the terms of the agreement. The full legal name and the mailing address of the lender. The note should also explain that the person or entity named is the lender. For example: Robert Doe, Lender or ABC Auto Financial Corp, Lender. The principal amount of the loan. This is the amount that the lender provides to the borrower. This does not include the amount that will be charged during repayment as interest. Review the amount for accuracy. The amount of interest that will be charged on the loan. This is generally expressed as per annum (yearly) or APR (annual percentage rate). While the highest amount that may be charged on most consumer loans is either 8% or 12%, it can also be as high as 45% provided that the interest amount is put in writing and the borrower signs the note and understands the interest rate. Payment information. Most Colorado promissory notes are payed in installments. These installments may be weekly, biweekly, or monthly. How the installments should be paid must be included. This section should also mention the amount of the payment. If the lender assesses a late fee, the amount should be listed as well as when it will be assessed. Let’s take a moment to talk about an additional inclusion of information for Colorado secured promissory notes. Another important component, aside from the proper title, is having an accurate description of the collateral. Without this information, it might be difficult to enforce it as secured. The court may hold that the promissory note is unsecured. Interest Due in the Event of Default. The specific purpose of this clause is to list the amount of interest the borrower will pay if they default on the loan. Payment Allocation. When a payment is made, the amount is split between the principal balance and the interest charged. This clause explains how the payment is distributed between those two items. Prepayment. A prepayment clause explains what happens if the borrower decides to pay off the loan earlier. In some promissory notes, nothing negative occurs. In other notes, the lender may charge the borrower a penalty amount for paying the loan off early. Acceleration. An acceleration clause gives the lender the right to demand the rest of the loan balance if the borrower doesn’t adhere to the terms of the promissory note. Attorney Fees and Costs. If a dispute arises, this clause explains how attorney fees and costs will be handled. The two more common arrangements include the borrower and lender paying their own fees and costs and the borrower paying the lender’s attorney fees and costs if the borrower is found to be in default. Waiver of Presentments. This clause explains that the borrower is still required to make their payments even if the lender is not actually present when the payments are made. Severability. This clause states that if any part of the promissory note is not enforceable, the rest of the note will not be thrown out. Conflicting Terms. This clause explains that if the promissory note has conflicting terms, an amendment will be created that will clarify the conflict and regulate the agreement. Notice. A notice clause explains whether the lender will provide notice to the borrower if a lawsuit is filed to obtain a judgment for default on the loans. The borrower and the lender must print their name, sign the agreement, and date it for the document to be properly executed. There is no legal requirement to have the promissory note witnessed or notarized.